The upcoming Noah film made Hollywood headlines when the rains and flooding of Hurricane Sandy halted production and damaged the ark kept in Oyster Bay, NY. Noah film Star Emma Watson tweeted about the irony, and Russell Crowe (who plays the title character) even managed to need a Coast Guard rescue after kayaking too far out during a break from filming. This isn’t the Noah we’re used to. Where press about this film isn’t focused on the super-storm irony, it’s focused on the new take writer/director Darren Aronofsky (Black Swan, The Wrestler) has taken on an old story. Filmed in Southern Iceland and New York, the setting is arid and desert-like, purposely ambiguous as to a specific time in history. The scorched landscape is central to the story, as the flood isn’t meant to rid the earth of violent hedonists, but a race who’s sin is their mistreatment of the planet. In the words of Hollywood insider Brian Godawa who read an early version of the script, that means Noah’s considered an “environmentalist wacko” whose warnings of the coming deluge go unheeded. Godawa sees The Day After Tomorrow-esque extra-biblical narrative as damaging, but not as intentionally malicious towards faith traditions. “I don’t expect Aronofsky to be true to this biblical message because he probably doesn’t really believe it. He’s just going to use it to communicate his own [message],” says Godawa. 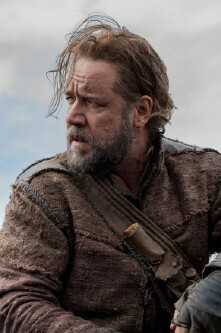 The movie, to be released next March, might prove offensive to Jews, Christians, and Muslims who view Noah as a hero of their faith. At the same time, the movie may prove to be an interesting fictional amalgam for faith-based people passionate about caring for the environment. But this all hinges on an understanding that “biblical epic” simply names a stylistic “sword and sandals” film genre, it’s not a badge earned for scriptural or theological accuracy or insight. Aronofsky may include a Genesis outline and several familiar characters, but what the story represents about God and humanity (and potentially even the angelic Nephilim race) seem radically transformed.